The alate (see second picture above) has the head and thoracic lobes black and the abdomen pale greenish white with a brown-black dorsal patch. 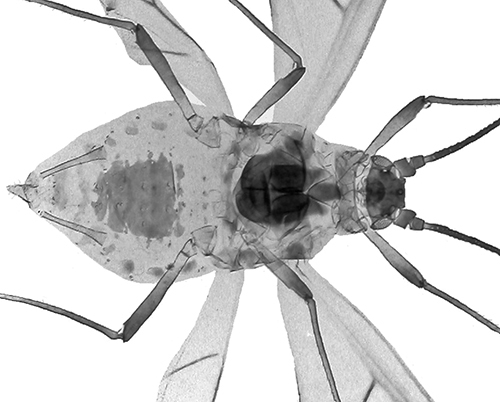 The alate body length is 1.3-1.8 mm. 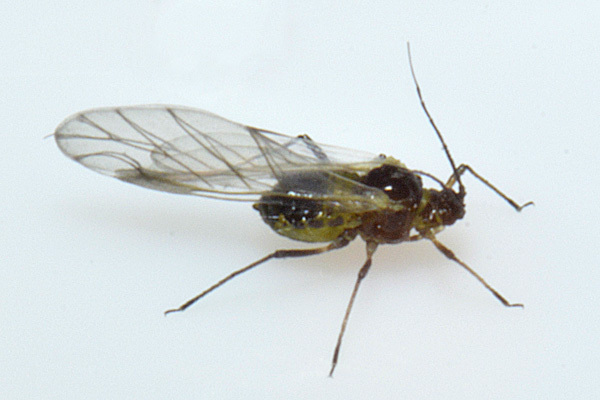 The image below shows a Chaetosiphon fragaefolii adult aptera in alcohol. The clarified slide mounts below are of adult viviparous female Chaetosiphon fragaefolii : wingless, and winged. Chaetosiphon fragaefolii feeds on strawberry (Fragaria species) especially the cultivated varieties. In Europe it is rarely found on wild strawberry (Fragaria vesca), but in America it is found on some wild species such as the Chilean strawberry (Fragaria chiloensis). Chaetosiphon fragaefolii usually occurs on new shoots, in the crown and close to the veins on the undersides of leaflets. The species mainly overwinters as parthenogenetic forms, although sexual forms have been produced in the laboratory. In the 1980s there were thought to be four species of Chaetosiphon on strawberry in America: Chaetosiphon minor, Chaetosiphon jacobi, Chaetosiphon thomasi and Chaetosiphon fragaefolii. Of these, Chaetosiphon fragaefolii and Chaetosiphon thomasi were thought to occur sympatrically on strawberry, rose and Potentilla, only distinguishable from each other by the number of submarginal setae. Following a detailed study on variations in karyotype (=chromosome number), chaetotaxy (=bristle arrangement) and morphology (=body proportions), Blackman et al. (1987) assigned the name Chaetosiphon thomasi to a rose-feeding species holocyclic on Rosa rugosa in British Columbia, with Chaetosiphon fragaefolii occurring on strawberry and Potentilla. Chaetosiphon minor and Chaetosiphon jacobi are distinct species found on strawberry in western and eastern USA respectively. Schaefers & Judge (1971) looked at the effect of temperature, photoperiod and host plant on the production of winged forms by Chaetosiphon fragaefolii. Apterous viviparae reared at a temperature of 23.9° C deposited significantly fewer alates than did those developing at 15.6° C. A reduced photoperiod during parental development enhanced the production of alate offspring. 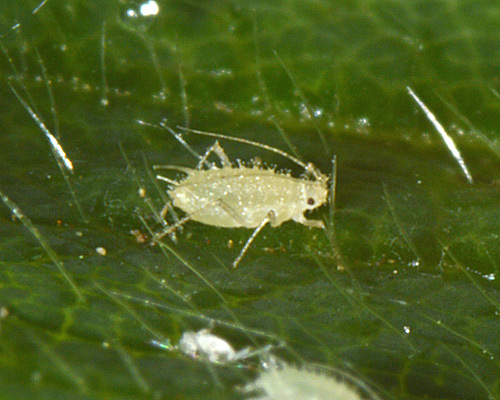 Parental nutrition also appeared to exert a major influence on the production of alate offspring with more alate offspring produced when the parent aphids were fed on old leaves than when fed on young leaves. Judge & Schaefers (1971) evaluated the effect of crowding on the production of winged forms by Chaetosiphon fragaefolii. Apterous parents reared at a higher density deposited surprisingly fewer alate offspring than apterae reared in isolation. However, adult apterae crowded for a 4-hour period off the plant yielded higher percentages of alates than aphids isolated off the plant. Bernardi et al. (2012) studied the biology and developed a fertility life table for Chaetosiphon fragaefolli on leaves of strawberry. Bernardi (2013) compared the effectiveness of different sampling methods and studied the population dynamics of the species in Brazil during two strawberry crop cycles. Chaetosiphon fragaefolii and Aphis forbesi were the main species associated with strawberry. The plant-hit method (weekly selection of four plants and tapping them over a tray lined with white vinyl acetate paper) and the Möericke water trap showed equal effectiveness to capture wingless and winged insects. The peak population of aphids in the state of Paraná occurred from September to November. Chaetosiphon fragaefolii predominated in all the samples. Cédola & Greco (2010) studied the seasonal abundance of the strawberry aphid complex under different agronomic practices in Argentina. Aphid densities were low in strawberry fields in which insecticides and fungicides were used. The aphid, Chaetosiphon fragaefolii was found in addition to Aphis fabae, Aphis gossypii, Myzus persicae and Macrosiphum euphorbiae. No parasites were found associated with Chaetosiphon fragaefolii. The pathogenic fungus, Entomophthora planchoniana was the main mortality factor. Blackman & Eastop list 8 species of aphid as feeding on Chilean strawberry (Fragaria chiloensis) worldwide, and provide formal identification keys. Of those aphid species, Baker (2015) lists 5 as occurring in Britain: Aphis gossypii, Aulacorthum solani, Chaetosiphon fragaefolii, Rhodobium porosum and Rhopalosiphoninus staphyleae. Blackman & Eastop list 20 species of aphid as feeding on wild strawberry (Fragaria vesca) worldwide, and provide formal identification keys. Of those aphid species, Baker (2015) lists 16 as occurring in Britain: Acyrthosiphon malvae ssp. rogersii, Aphis craccivora, Aphis fabae, Aphis ruborum, Aulacorthum solani, Chaetosiphon fragaefolii, Ericaphis wakibae, Macrosiphum euphorbiae, Myzus ascalonicus, Myzus cymbalariae, Myzus ornatus, Myzus persicae, Neomyzus circumflexus, Rhodobium porosum, Rhopalosiphoninus staphyleae and Sitobion fragariae. Chaetosiphon fragaefolii is one of the most serious pests affecting strawberry plants. 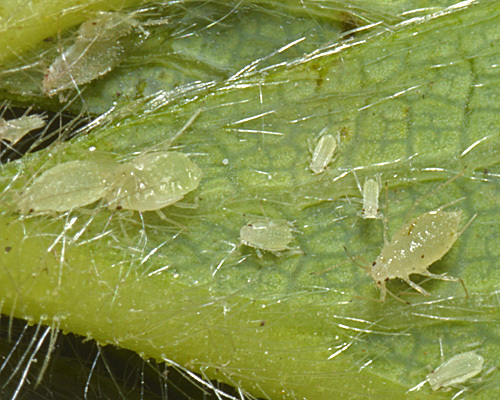 Direct damage is caused by the aphids sucking sap from the plant, which reduces the yield and quality of fruit. This is especially the case when fumagin fungus grows on the honeydew that aphids excrete. In addition the species is the principal vector of 6 viruses. Strawberry mild yellow edge virus (SMYEV) and strawberry crinkle virus (SCV) are two of the most pathogenic viruses affecting strawberry. In Germany strawberry yellow edge and strawberry crinkle were first observed in 1974 (Krczal,1979)). Since then, only strawberry yellow edge has spread. 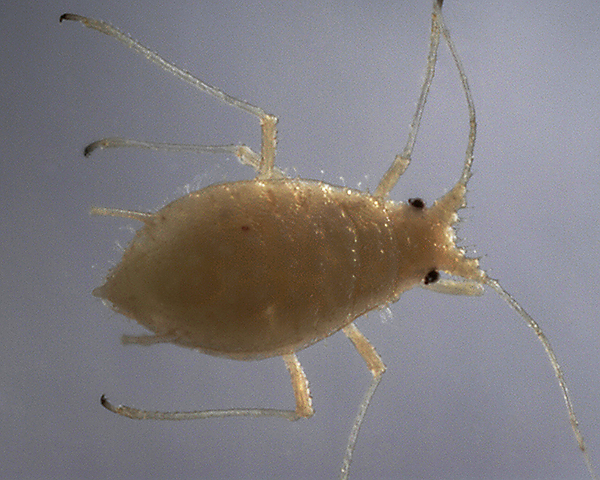 Biological data collected on the strawberry aphid in laboratory experiments indicates, that the natural spread of the strawberry crinkle virus is affected by the life span of the strawberry aphid. 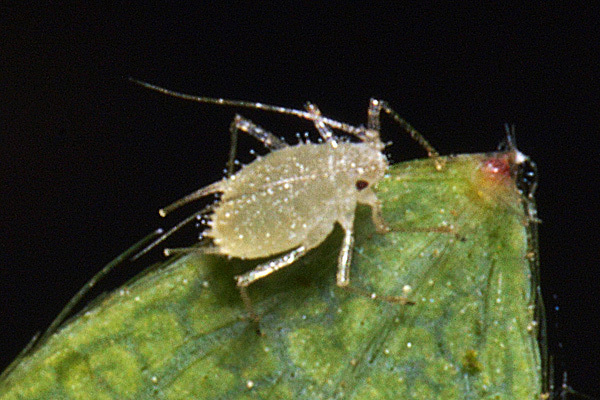 The number of aphids which live long enough to complete the latent period of the virus in the vector may be not sufficient for a fast spread of the disease. In the USA Rondon & Cantliffe (1997) reported the arrival of Chaetosiphon fragaefolii in damaging numbers on strawberry for the first time in Florida. Rondon & Cantliffe (2005) summarise the situation in USA for biology and control of Chaetosiphon fragaefolii. They emphasise the importance of plant monitoring which should begin early in the season and continue throughout the duration of the crop. Chemical control should be considered as a first measure if viruses transmitted by this aphid are detected. Hildebrand & Lewis (2014) provide a useful up-to-date account of the epidemiology of aphid vectored strawberry viruses in the USA. 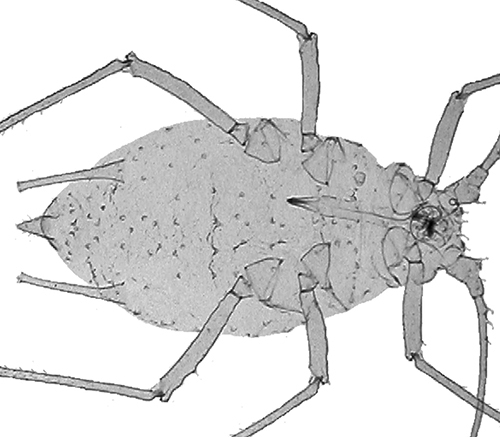 In UK Dicker (1952) carried out some of the earliest work on the natural enemies of the strawberry aphid. Solomon (2001) gave a detailed review of the natural enemies and biological control of strawberry pests including Chaetosiphon fragaefolii in Europe. At that time most control was by organophosphorus and carbamate insecticides, but these were about to be withdrawn prompting a search for other control methods. Fitzgerald & Solomon (2001) undertook experiments to determine the species of carabids present in apple orchards and strawberry plantations in UK, and their distribution within the plantings, and to determine whether these beetles are able to reduce strawberry aphid numbers on plants in the laboratory. In laboratory feeding tests several species of carabid were found to feed on strawberry aphids, and two species were able to feed on aphids on 'simplified plants', indicating that they have some ability to climb the plants and gain access to aphids. 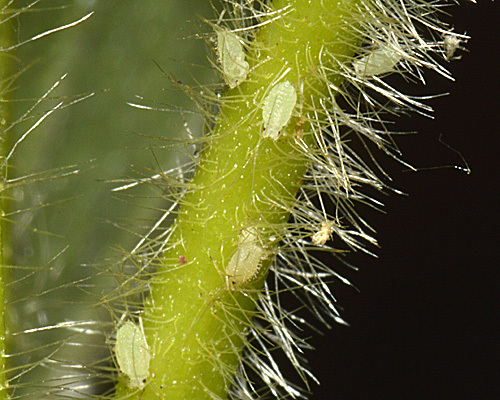 Several species are therefore likely to provide some measure of biocontrol of aphids in strawberry plantations. In Belgium, de Menten (2011) used a cocktail of six species of parasitoids to control aphids on strawberry in biological and integrated pest management cultures. As the aphid populations are different from one year to another and from one place to another, the author used a mix of different species of parasitoids covering all the aphid species possibly occurring on that plant. The design of the release points was studied and optimized in order to simplify the manipulations necessary to deploy them. After three years of R&D in the laboratory and in the field and two years of large scale field trials in Belgium, it was concluded that FresaProtect was an efficient treatment for aphid control. We especially thank Alan Outen (Bedfordshire Invertebrate Group) for his assistance.